Asus releases a new 15-inch full-screen IPS anti-glare Full HD Ultrabook that runs on Windows 10, the Vivobook S15 S510UF-BQ050T. It is equipped with a dedicated SSD storage solution, a Kaby Lake Refresh low power Quad Core i5 processor, a good amount of RAM, a dedicated SSD storage solution, a dedicated NVIDIA graphics card Pascal with Optimus technology, a USB 3.1 Type-C connection, a biometric reader or a backlit chiclet keyboard. It appears for less than 820 euros . It has an elegant look with a light brushed metal finish inside and dark at the hull. 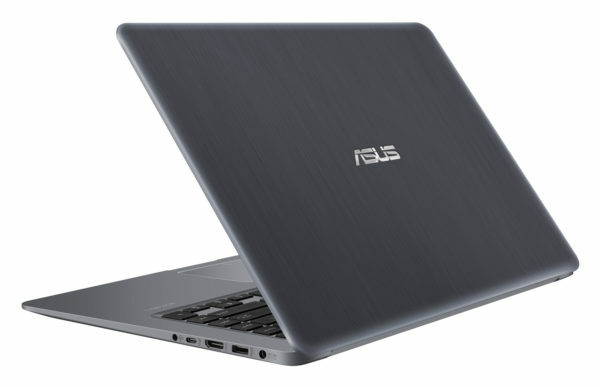 The Asus Vivobook S15 S510UF-BQ050T is a compact 15-inch high-definition notebook designed for versatile use. Thanks to its 8 GB of RAM and its quad-core Kaby Lake Refresh i5-8250U processor, which is more powerful than a low-power Kaby Lake Core i5 under the multi-core architecture, this Ultrabook delivers good overall performance. And all the more so because it relies on a dedicated SSD storage solution much faster than a hard drive but also less energy consuming, more robust and silent. So in practice, this Ultrabook is significantly more responsive and fluid than if it had been equipped with a hard disk. If the 256 GB SSD is too good, you can add a hard disk (or a second SSD) via the 2.5 inch free slot. You can also use an external storage unit. Opting for a USB 3.0 device then represents an interesting solution because it takes advantage of transfers made up to 10 times faster than USB 2.0. The integrated connectivity includes just 3 USB all compatible both USB 2.0 and USB 3.0 including 1 USB 3.0 but also 1 USB 3.1 Type-C, Bluetooth 4.1 wireless modules and Wi-Fi ac to communicate and connect remotely, an audio port or a convenient HDMI video output to easily connect this PC to a TV or monitor for example. The screen is an IPS model offering a more accurate colorimetry than the average and important vertical and horizontal viewing angles. Anti-reflective, it is more legible than a bright slab in a bright environment. Full HD, the screen is also very suitable for displaying High Definition content and especially videos because of its 16 / 9th format. Whether with the Intel UHD 620 graphics solution housed within the Kaby Lake Refresh or the GeForce MX130 dedicated card, we can obviously look at photos and videos on this Ultrabook that takes advantage of NVIDIA Optimus technology. Optimus switches in practice automatically and in real time between the Intel UHD 620 and the GeForce MX130 when necessary. It prefers to the maximum the first despite its modest benefits because its low energy consumption promotes autonomy compared to the GeForce MX130. More powerful and greedy than the Intel UHD 620, the GeForce MX130 is able to run games not too demanding graphics resources as long as you make adjustments to get a good fluidity. Finally, a Windows Hello compatible fingerprint reader is present to identify easily on this computer. Chiclet style, the keyboard is missing a keypad that will certainly regret some while it is a standard in 15 inches. On the other hand, many people will appreciate to be able to backlight the keys in order to distinguish them clearly when the ambient luminosity is low.